Partly cloudy skies this evening will become overcast overnight. Low 48F. Winds light and variable..
Volunteer Aaron Reibe serves lemon meringue pie to Sandy Yakkel of Longview as she receives treatment for Crohn's disease at the Lower Columbia Regional Cancer Center. Reibe encouraged Faye Meyer, a seamstress who lost several relatives to cancer, to help other patients by making quilts like this one from leftover Relay for Life T-shirts. Reibe greets Mary Steele of Kelso, a lung cancer patient who calls him "a gem. He's so happy go lucky, he brings up your spirits," Steele says. In three years, Aaron Reibe has transformed the volunteer program at the Lower Columbia Regional Cancer Center in Longview. "He is magnificent," said Faye Meyer of Longview, who lost three family members to cancer in the last year, "boom-boom-boom." "He is a beacon. They have truly found someone who knows and understands all the dynamics of cancer." Reibe (RYE-bee) works at the center up to eight hours a week and pops in often since he became team leader. He would work more, he said, but he runs out of energy easily. "I have the mind of a 32-year-old and the energy of an 80-year-old," said Reibe. "I burn out real quick." That he burns at all is kind of a miracle. Reibe, who graduated from Mark Morris High School, went to Washington State University and from there to a high-flying career in hospitality. For five years, he was pulling down $70,000 a year in San Diego, first as operations manager at a San Diego Ramada Inn and later as a dealer and floor supervisor at the Barona Ranch Resort and Casino. "I was dealing $50,000 games," Reibe said. "Once I gave a guy a million bucks in 15 minutes." With comped housing at the casino, and being a numbers person, he was also socking away savings. Reibe had enough to quit in 2006 and visit his sister Nicole, a doctoral candidate at Princeton Theological Seminary who was living in Switzerland. Then, by himself, he spent nine months wandering the world. Reibe explored Prague, Sarajevo, Turkey, Barcelona, Monte Carlo and Morocco. In fall of 2007, he came home to walk the Portland marathon with his mother, retired accountant Peggy Reibe of Longview. Just after the event, Aaron started having severe stomach pains. He put off going to the hospital but finally went in. Thanks to a new oncologist at St. John who by chance recognized the clues, Reibe was diagnosed with pseudomyxoma peritonei, a rare, lethal cancer that was strangling his internal organs in swiftly growing, slimy tumors made of mucus. "They gave me seven days to live," Reibe said earlier this week. "Seven days." Horrific prognosis, with an extra complication. Reibe, active and fit, had let his health insurance lapse while he circled the globe. To pay for treatment, he emptied his remaining savings and his 401-K while his family launched an international prayer chain and a round of fundraisers. Local surgeons had never seen pseudomyxoma peritonei. With help from his mother and sister, Reibe researched the 19 cancer surgeons with experience operating on the rare condition, visited several of the best, and chose Dr. Armando Sardi of Mercy Medical Center in Baltimore. In January, 2008, Reibe underwent a 15-hour surgery at Mercy Medical. "They took out 11.7 pounds of cancer," he said. "They removed 60 percent of my stomach, most of my liver and bladder, portions of my pancreas and diaphragm, all of my appendix and spleen ..."
What surgeons did not remove, "they skinned to get the mucus off." Just after surgery, Reibe had "quarts and quarts of hot chemo" — at 106 degrees — pumped into his open body cavity. "It was the most aggressive treatment possible. I had a 10 percent risk of dying during surgery, and a high risk for a colostomy bag and feeding tubes," he said. "I came out of it 100 percent OK," no tubes, no bag. Back in Longview, he had nine more months of chemotherapy at the Cancer Center. Observing Reibe today, no one would guess what he's been through. Those repercussions are private. He has "bathroom issues," he said, because food just goes right through him. But he got through chemo with no aversion to food, so he consumes twice as much as he can actually digest and has gained 30 pounds. He also bursts with energy — in spurts. "I can't hold a 40-hour-a-week job," Reibe said. He takes about five naps a week, for three or four hours at a time. When he's busy, he said, "I can push through. But then I'll be in recovery for three or four days. ... I know I can't work the way I want to, but do I believe it? No. "It's hard to accept these boundaries, so I end up wiped out." Reibe lives on Social Security Disability and makes about $300 a month at a small service job he created called Aaron's Errands. He makes $12 an hour delivering documents, picking up titles and managing For Sale signs for local real estate agencies. "It's a way to get out of the house, where I watch more TV than I should," he said. His passion is the Cancer Center at St. John Medical Center. Reibe has a blood draw there and sees an oncologist every three months; so far he has a clean bill of health. But his mission at the center is not his own care. It's the comfort of others. On a typical day at the Lower Columbia Regional Cancer Center, dozens of patients receive chemotherapy, radiation and other related treatments. Mary Steele of Kelso visits daily for radiation to treat her lung cancer and on some days receives 9-hour doses of chemotherapy. "The first time I came I was so scared," she said. "Aaron brought me food. Wow, he made me feel so much better that day. We hit if off." Reibe's presence makes her feel better about coming to the center, she said. "You walk through the door and see that smile," said Steele. "He brightens me up." Little things mean a lot, said others who have watched Reibe pass out candy and neck warmers, gloves and hugs. 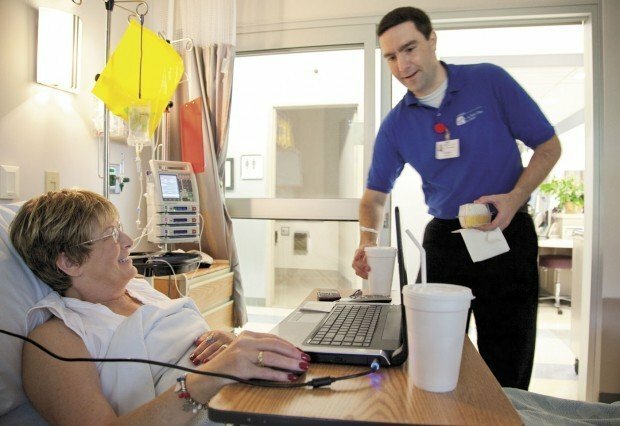 In an alcove in the chemotherapy unit, he stocks a refrigerator with hospital food that he elevates far beyond its rep.
"Look at this salad," he raves to a patient. "I've got lots of dressings. What'll you have?" He concocts milk shakes from Ensure and ice cream and "Mimosas" from orange juice and Sprite. "This is ‘Grandma's House,' " Reibe quips. "We're here to take care of you." It's not enough to do his own schtick. Reibe goads others to volunteer, telling them, "use your talents — you can give back." And they do. His own grandmother has made shawls. And Meyer has overcome her emotions visiting the Cancer Center and pitched in. "I see the pain and fear and I want to cry for them," she said. "But Aaron can get past that. He told me I would get past it, too." 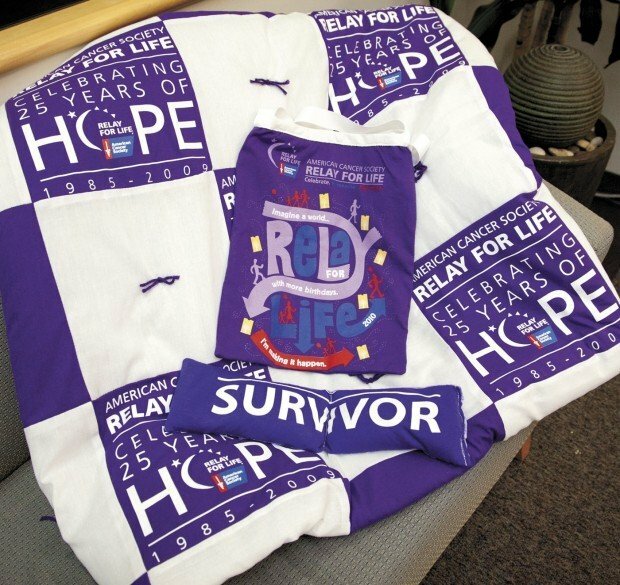 When local organizers of Relay for Life had 75 T-shirts left unsold last year, Reibe challenged Meyer, who sews, to do something with them. "I looked at all those purple T-shirts," Meyer said, "and I remembered what Aaron told me." She stitched the shirts into neck warmers and pillows and five bed-size quilts. Reibe is convinced that those who have experienced the Cancer Center make the best volunteers. He recruits patients and their relatives, and saves letters and cards as proof of the difference a volunteer can make. In a card from Suzie Sager, who died July 15, the Kalama woman wrote to Reibe, "I don't know how I could have done this without you by my side! You were my strength when I was weak." Of the people diagnosed with pseudomixoma peritonei, "the average person lived 5.6 years after successful surgery," Reibe said. "One person survived 17 years. The outlier. "I'm 20 years younger than the average person that gets this," he said. "I'm in better shape. I'm in better spirits." Reibe said he never thinks about dying. "It's not in my thought process. It's not there." His attitude has been rocked by skating so near that edge, however. "I used to think about making $100,000 a year, retiring at age 50, living the good life," he said. "I don't have the energy to work like that any more. And I don't care. "Now, I make $20,000 a year," he said, "but I have the same level of joy, the same happiness. "I'm not concerned with being 50. What am I going to do today? Memories of any troubles are very, very short term. I don't have any time to dwell on disappointment. "Look, this is my philosophy: The same things happen to every person. You have troubles in school, your relationships go sour, you have health problems, your parents die. "There are no exceptions. The timing is just different. What you can choose is your reactions." Reibe chooses the cancer ward. "This is a fun, lively place," he said. "It's like ‘Cheers.' If you walked in, you might not even know it's hospital. "When you show up, I'm going to hand you a Coke Float or a Mimosa and a hot plate of food. I make popcorn. "If you dread coming, you might quit. I want you to want to be here. I want you to know you can live again." The 23rd local Relay for Life, affiliated with the national cancer fundraiser, takes place from 10 a.m. Saturday to 10 a.m. Sunday at the Cowlitz Regional Expo Center and nearby Cowlitz County Fairgrounds, corner of 7th Avenue and Washington Street, Longview. Representative of 87 local teams raise pledge money, camp out at the site and walk the track during the 24-hour event. On Saturday, visitors can enjoy bands, singers, tap dancers and belly dancers; visit a health education tent and get free cancer screenings; and make donations. Donations of choice will be accepted in exchange for a candle honoring those who have struggled with cancer. The candles are placed in white bags with personal messages that line the track and are lighted at night for the Luminaria Ceremony and silent lap at 10 p.m.
Food will be for sale, and activities for children and teens are part of the event. Donations to the local Relay for Life, which fund cancer research, education programs and patient services, also can be made. Checks may be made out to American Cancer Society/Longview Relay, and mailed in care of Lucy Calhoun, 1335 3rd Ave., #225, Longview, WA 98632.